If you’re growing a business in Texas, NOT HAVING A LAWYER IS A REALLY BIG MISTAKE. I’ve heard the radio ads, and the LegalZoom television ads telling listeners that they don’t need a lawyer to start up their businesses. They tell you that they can prepare all of the documents you need for a fraction of the cost of a lawyer. They claim that the work they provide you is “good enough” for your needs. Is “good enough” good enough for you? Starting a business is not for the faint of heart or the weak of stomach. There are a lot of unknowns out there. And there are a lot of steps to perform and a lot of alternatives to consider along the way. The right way for one business may be the dead wrong way for yours. So there is no single solution for your business. Yet one “cookie cutter” solution is all that LegalZoom and the others can provide you. How do you know that there isn’t a better solution out there for your business? LegalZoom and the others can’t suggest or recommend another course of action for you because they aren’t lawyers and it is against the law for them to do so. These partial answers to your legal problems can spell disaster for you in the long run. And it is a lot more expensive to fix legal problems than it is to get them right the first go around. With this information you may decide to do all or just a few of the things on your legal checklist. You may decide to have the lawyer do all of these things for you, or you may decide to take care of some of these details yourself. But the bottom line is that a lawyer can help you make informed decisions. And if you have a good relationship with your lawyer, he will contact you periodically to make sure that your past decisions are still the best ones for your business. LegalZoom and the lot can’t and won’t do that. I’ve been helping my clients make informed business decisions for a quarter of a century. During that same period I’ve made a good living fixing the legal messes that people make when they act without getting the facts. Trust me, it will cost you more to fix your mistakes than it will to do it right the first time. I would be honored to help you grow your business. But even if you don’t hire me, consult with an attorney that you trust and maintain a good, long-term relationship with him or her. 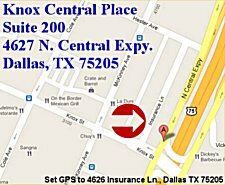 Our Dallas Office has Moved!